Become a VITA Volunteer Superhero! Is your schedule flexible? Would you enjoy helping make our community more affordable for everyone? Do you want to be a SUPERHERO to some of your hard-working friends and neighbors? Become a volunteer during our upcoming VITA tax preparation season! Volunteers work as IRS certified tax prep assistants or greeters. Bilingual volunteers are needed as tax prep assistants, greeters or translators. VITA provides free tax preparation service to residents earning $54,000 or less annually. Tax preparation events are scheduled regularly throughout the Keys, January - April. No tax preparation experience needed--just a willingness to learn, grow, and serve. 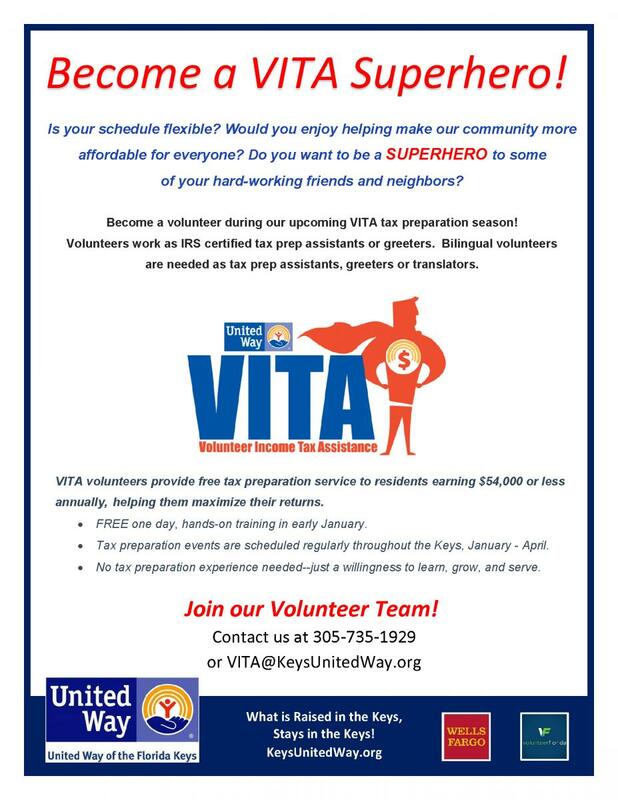 Join us as a VITA volunteer and you will help fellow Keys residents maximize their tax return so they are better able to provide for their families.